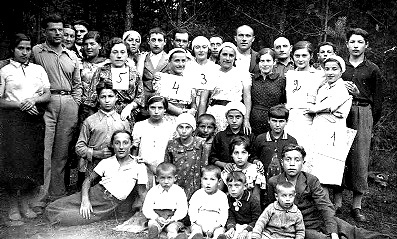 After WW1 many Utyan Jews, who had stayed in Russia as refugees during the war, returned home. 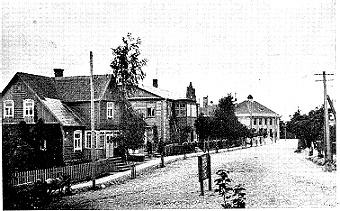 Jews from surrounding villages and even from Vilna also settled in Utyan. According to the first census performed by the new Lithuanian government in 1923, there were 4,890 residents in Utyan, including 2,485 Jews (51%). This ratio of Jews to non Jews was more or less constant during the period of independent Lithuania (1918-1940). According to the autonomy law for minorities issued by the new Lithuanian government, the minister for Jewish affairs Dr. Max Soloveitshik ordered elections to be held in the summer of 1919 for community committees in all towns of the state. In Utyan a committee was elected which collected taxes as required by law and was in charge of all aspects of community life. It was active till the end of 1925 when the autonomy was annulled. The first chairman of the committee was the cloth merchant Yisrael Beker and after he immigrated to Argentina, Nisan Latz replaced him. Zaideman was the secretary of the committee. When tax payers refused to pay the taxes the committee had imposed on them, the young new chairman suggested rebuilding the almost ruined "Mikveh" with the money collected, and thus the problem was solved. After the committee was dissolved, all its property was transferred to the Jewish Folksbank. From then on this institution became the central focus around which many social activities took place. During many years there were Jewish mayor in Utyan: Avraham Zhurat. In the municipal council elections in 1931, seven Jews out of 12 council members were elected: Eliyahu Cohen, Shalom Zalman, Dr.Avraham Etingof, Yisrael Tsigar, Shalom Lifshitz, Yosef Glikman, Shalom Gold. The Jewish magistrate Yerakhmiel Berman served the town for sixteen years, until his retirement in 1935. At the elections for the first Lithuanian Seimas (Parliament) in October 1922, Utyan Jews voted as follows: for the Zionist list-1,717 people, for "Akhduth" (Agudath Yisrael)-66, for the Democrats-12. Lithuanian rule having been established, Utyan was declared a district center, upon which the town's economy developed quickly, with Jews also enjoying its benefits, making their living mainly from trade, crafts and light industry. They traded in flax, leather, timber, fruit, eggs, bristles, which they would buy from peasants in the villages or in surrounding towns, and sell on market days and fairs. Merchandize was exported abroad through nearby Dvinsk in Latvia, or through Ponivezh, which was connected to Utyan by a narrow gauge railway. However, the establishment of produce and marketing enterprises by Lithuanian cooperatives and governmental companies caused Jews to be pushed out of the wholesale and export trade. 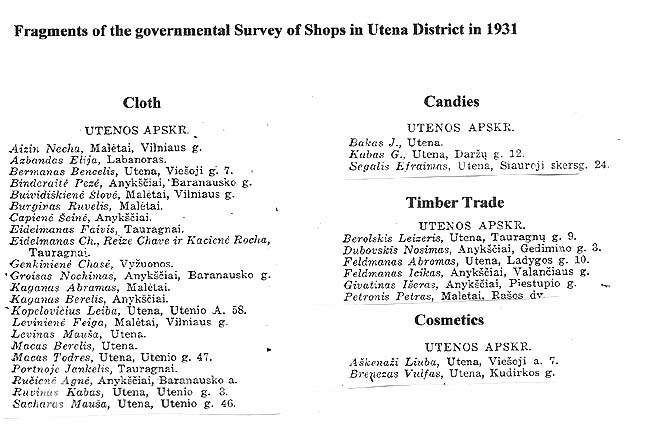 In 1937 Utyan had 150 Jewish artisans: 31 shoemakers and stitchers, 19 needle workers, 18 butchers, 17 metal workers (tinsmiths, blacksmiths, locksmiths), 13 bakers, 10 carpenters, 6 hatters, 6 barbers, 6 painters, 5 felt boots makers, 5 watchmakers, 4 knitters, 2 glaziers, 2 book binders, 2 photographers, 1 oven builder, 1 electrician, 1 printer and 1 saddler. Jews also produced vegetables and fruit on leased land. During this period there were 2 Jewish lawyers (out of 3 in the town), 3 dentists and 1 doctor (out of 3). The Jewish Folksbank, established after the war with the help of the "Joint" association, played an important role in the economic life of the town. It numbered 35 members in 1920, by 1929 there were 529 members, and in 1935 about 600. There was also the "Gemiluth Hesed" society, which gave small interest- free loans to anybody requiring such a loan. This society was headed by Shemuel Lifshitz, Kathriel Finkel and Kalman Goldfain. There was also a branch of "The United Association for Credit for Jewish Agriculture in Lithuania", whose center was in Kovno. 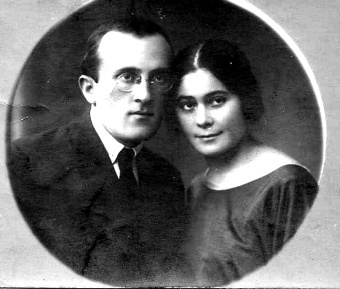 Relations between Jews and Lithuanians were more or less normal till the beginning of the thirties. Occasionally there were some acts committed by ruffians, for example in 1926 four hoodlums attacked Jews walking in the street and chased them to the J.S.C. (Jewish Sport Club) club, where they smashed the windows. Even during the years of autonomy, Jews had no equal rights. In 1922, land in the new part of the town was re-parceled and hundreds of plots were divided among residents, but all Jewish requests to receive plots were denied. The situation of the Jews also began to deteriorate because of government intrigues, which pushed Jews out of the wholesale and export trades and imposed unreasonable taxes on them. There was also the influence of the Association of Lithuanian Merchants (Verslas), who spread propaganda to persuade people not to buy in Jewish shops. Another decree imposed on the Jews was to move market day to Sabbath, and there were other hard steps. All these caused many Utyan Jews, mainly the youth, to look for their livelihood in the bigger towns of Lithuania or in far away countries. Many immigrated to South-Africa, America, Cuba and Argentina, some of them later supporting those relatives who had remained in Utyan. We can learn from the deeds of a prominent member of the community, Berl Sher, with many children and who was for many years a member of the municipal council, about the hard conditions of most of Utyan Jews, who had to change their occupation frequently in order to make a living. His main occupation was covering roofs with slate, but often he baked beigls, produced candies and knitted socks. In the summer he traded with different berries and before Pesakh he supplied the community with Matsoth. 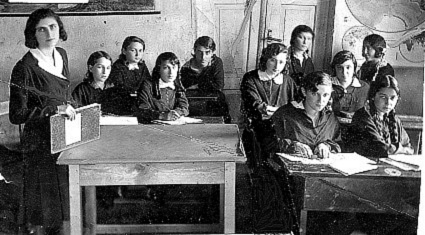 Utyan Jewish children studied in two schools which were opened in the beginning of 1920. There was the Hebrew school of the "Tarbuth" chain with four classes and one preparatory class in which an average of 150 pupils studied, among its teachers Zar, Binder, the couple Laikh, Zilber, the director Matityahu Berkal and others. The second was the Yiddish "Cultur Lige" (Cultural League) school, where about 80 pupils studied, mainly from the poorer areas. The parents committee of this school also cared for the clothing and feeding of the needy children. Among the teachers of this school were Naftali Shteiman, his wife Rachel, Dambe, Lafkovsky. For several years an adult school was located in this school building, which in fact was like a popular university with leftist tendencies. During regular lectures about 50 people participated, but social and cultural events initiated by this institution, such as the drama circle, involved very many young people. After the fascist revolution in Lithuania in 1926, new rules discriminated more and more against this institution till it was closed. In the beginning of the thirties the director of the Yiddish school was accused of communist activity, detained and expelled from Lithuania. So was the acting director, the teacher Yosef Gar who was close to the "Poalei-Zion-Smol" (Leftist Zionist Workers ) party, who was also detained and exiled from Utyan to Shaki. 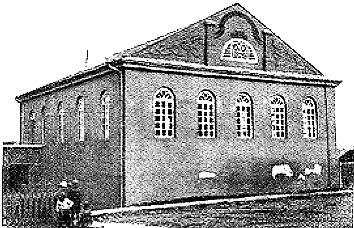 From 1923 a Hebrew pro-gymnasium with about 50 pupils operated in town, some of these pupils continuing their studies at the Hebrew high school "Or" (Light) in Vilkomir. There were two public libraries: one of "Tarbuth" with about 100 Hebrew books and the second of the "Cultur Lige" with about 700 books, mostly in Yiddish. After the "Cultur-Lige" was closed by the government, the library was transferred to the "Libhober fun Visen" (Friends of Knowledge) society. During this period most religious activity continued to concentrate around the six prayer houses, one of them being the "Hasidim". The handful of Hasidim had reconciled to the hegemony of the "Mithnagdim", but from time to time controversies broke out over different issues. The watchmaker Hayim Karpov, of Hasidic origin, initiated a campaign to delete the tax on yeast and to sell it at lower prices, in order to lighten the burden of poor women baking Haloth for Shabath. However, as most of the public did not want to harm the Rabbi, whose salary largely depended on this tax, it was collected till the advent of Soviet rule in 1940. In several of the prayer houses societies for studying "Talmud", "Ein-Ya'akov", Mishnah and Tehilim were active. In 1920 a "Yeshivah Ketanah" was established, named "Atereth Binyamin" after Rabbi Binyamin Aizenshtat who had just died. The Yeshivah was headed by Meir-Yitshak Leib and David-Yitshak Traub, and later came under the patronage of the Telz Yeshivah. Among the welfare institutions acting in Utyan were: "Lehem Aniyim" (Bread for the poor), "Tsedakah Gedolah" (Charity), "Linath HaTsedek", "Bikur Holim" (Help for the ill) and "Hakhnasath Kalah" (Help for poor brides). Every Utyan Jew could get medical treatment and hospitalization in the big Jewish hospital "Bikur-Holim" in Kovno for a small monthly payment. The "OZE" organization concentrated on preventive medicine among school children. It also organized summer camps for weak children in which about 40-50 children participated every year. The doctor was Kukliansky. Except of the monthly member's fee of one Lit, there were also performed from time to time tag days for collecting money for this organization. For some time it also activated a clinic where the poor got free medical treatment. Among Utyan Jews many belonged to the Zionist movement, and all Zionist parties were represented. There were also the religious anti-Zionist "Agudath-Yisrael" and the leftist anti-Zionist "Folkspartei" parties. The Zionist youth organizations in Utyan were: "Hashomer-HaTsair", Betar and others, in addition to an urban Kibbutz of "Hekhalutz". Sports activities, mainly soccer, were performed in the local "Maccabi" branch, with an average of 115 members. There was also the Yiddishist sports club Y.S.C. with about 110 members in1926.